Hot! Hot! Hot! 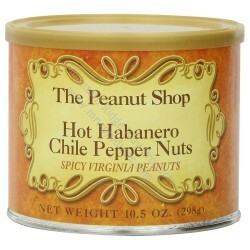 Super extra-large Virginia Peanuts, handcooked and covered with The Peanut Shops "hotter than hell" seasonings. Made from the highest market grade peanuts available with a Habanero Chile Pepper seasoning. 10.5oz.